Just over 24 hours to go the UK voters cast their ballot! Prime Minister Theresa May toughens her anti-terrorism stance, vowing not to let human rights stand in the way of restricting the freedoms of suspects. But some final polls for the general election show the country could end up with a hung parliament as Jeremy Corbyn's Labour party has diminished the gap with Conservatives. Gold hits a seven month high as investors eye a number of political risk events, including former FBI director James Comey's testimony in Congress tomorrow. President Trump weighs into the Gulf state rift, supporting the isolation of Qatar, while a report suggests Russian hackers played a part in causing the dispute. The British people will vote tomorrow to choose a new government in what's seen as a head-to-head showdown between Theresa May's Conservatives and Jeremy Corbyn's Labour party. The Prime Minister has endured a difficult campaign, which has seen her come under pressure for dodging debates and backtracking on her party's controversial 'dementia tax' policy. May has attempted to focus her campaign on Brexit, repeatedly arguing that no deal was better than a bad deal. More recently she's had to defend her record on police cuts in the wake of the terrorist attack on London Bridge. On the other side of the spectrum, Labour's Jeremy Corbyn has surprised pundits with his rise in the polls, focusing on issues like health care and education. The left-winger plans a major overhaul of the UK economy, including hiking the corporation tax to 26 percent. He's also eager to nationalise some British industries including railways. The Labour leader is also facing tough questions on his leadership. Some critics claim he would be too soft on defence. 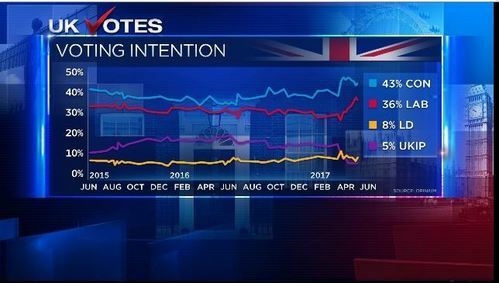 Theresa May has seen her poll lead slashed in the last month from around 22 points to single digits. An Opinium poll shows the Tories with a 7 point lead while a Survation survey shows Corbyn only 2 points behind. UK Prime Minister Theresa May said on Tuesday she will change human rights laws if they impede her from tackling terrorism. During a campaign event in Slough, May said she wanted longer prison sentences and to make it easier to deport those convicted of terrorist offences; alongside greater restrictions on the freedoms and movements for those suspected of terrorism. She said that human rights laws that stop her from implementing these changes could be scrapped. The Conservative manifesto pledges that the UK "will remain" signatories to the European Convention on Human Rights for the duration of the parliament, but says that the Human Rights Act will be reconsidered once the process of the UK leaving the European Union is completed. Let me just tell you a bit about what I mean by that. I mean longer prison sentences for those convicted of terrorist offences. I mean making it easier for the authorities to deport foreign terrorist suspects to their own countries. And I mean doing more to restrict the freedom and movements of terrorist suspects when we have enough evidence to know they are a threat, but not enough evidence to prosecute them in full in court. And if, if our human rights laws stop us from doing it, we'll change those laws so we can do it. Labour leader JeremyCorbyn told supporters his party would invest to create a growing, sustainable economy with access to tariff-free trade with the European Union. He warned of the consequences of another five years of Conservative rule and asked voters to think of what kind of country they wanted to live in. Liberal Democrat leader, Tim Farron, spoke of the need to increase investment in security, and police numbers in particular. Meanwhile, UKIP leader Paul Nuttall asked voters to vote tactically in constituencies where UKIP don't have candidates. The response in London and in Manchester, in response to those horrific terrorist attacks, you don't turn on each other, you turn towards each other and bring people together in unity, as a community. (applause and cheers) And this election is fundamentally a choice. Another five years of a Conservative government ( crowd shouts "No!") I take that as a no then, to another five years of (Tory) government thank you very much, I knew I could rely on Telford. What it will do is continue the underfunding of our NHS, continue the crisis in our schools, continue the crisis in our housing and continue the unfair treatment of the majority of the population whilst at the same time handing more tax giveaways to those at the top end. French President Macron is on course for his second historic election victory in as many months. 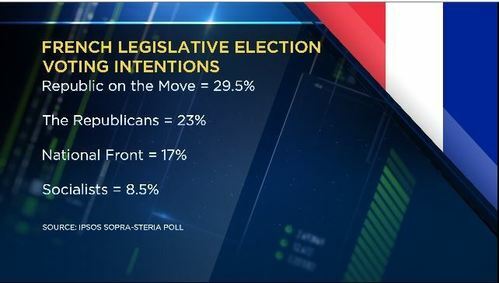 That's according to the latest poll from IPSOS, which shows his 'Republic on the Move Party' winning the country's biggest parliamentary majority since 1968. The centre-right 'Republican' party is projected to come second, while the National Front is seen winning around 17 percent of the vote. Emmanuel Macron's government has set out its roadmap for reforming the French Labour market. It is aiming to get parliament to pass a reform bill updating the country's labour laws by the end of September. The French Prime Minister Edouard Philippe promised extensive consultation with the country's unions, who are likely to oppose Mr Macron's drive to make the French labour market more flexible. A children's cancer charity run by President Trump's son Eric reportedly paid the family business more than 1.2 million dollars for fundraising events at Trump golf resorts -- despite claiming it was using the golf courses for free. According to a report by Forbes -- donors were told their money was exclusively going to help sick children -- but more than 500 thousand dollars was re-donated to other charities. At least four of those groups then paid to hold charity events at Trump golf courses. The Trump organization said in a statement "at no time did the Trump Organization profit in any way from the foundation or any of its activities." Former FBI Director James Comey reportedly told Attorney General Jeff Sessions that he did not want to meet alone with President Trump after he asked Comey to end a probe into former National Security Advisor Michael Flynn. According to a New York Times report -- Comey told Sessions that private interactions between the President and FBI Director were inappropriate. Comey testifies before Congress tomorrow. Greece's ruling party says the latest IMF proposal in not helpful in reaching a QUOTE "honorable solution" to the country's impasse with its European creditors. The IMF is pushing for creditors to agree to a debt haircut, which Berlin has vehemently rejected. The agency's director Christine Lagarde has proposed a deal in which the IMF stays in the bailout but offers no further aid until debt relief measures are clarified. Greece faces a series of debt repayment deadlines in July. But the country will not be able to fullfill its obligations unless it gets a loan from its current bailout. A lot has happened in Greece in seven years, the twin deficit have disappeared, there is a huge fiscal consolidation. The country is still not out of the woods. The economy is showing some signs of life but what is needed is a signal on the debt which will lift the uncertainty as we move forward. Greece leaving the euro zone is not a solution. Think of it this way, we have done all the hard work, we have done this internal evaluation. If at the end of this road and you have done all the costs, and then you decide to leave you incur higher costs and further depression. A man is under arrest in Britian as part of the investigation into the deadly London Bridge attack. Police are also identifying the third attacker as Youssef Zaghba. He was able to enter the UK despite being on an EU-wide watch list. Reports suggest the Moroccan-Italian was stopped at Bologna Airport in 2016 on suspicion of travelling to Syria. Extremist material was found in his luggage. The UK Home Office has declined to comment on reports. Meanwhile, the French Police shot and wounded a man after he attacked a police officer with a hammer outside Notre Dame Cathedral in Paris yesterday. Police say the man yelled "this is for Syria." France's Interior Minister says early indications are the man acted alone. 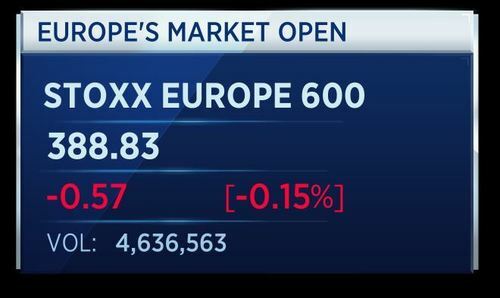 Bourses in Europe are set for a mixed open on Wednesday morning as investors opt for less risky options ahead of the U.K. General Election and a European Central Bank (ECB) meeting. CNBCBourses in Europe are set for a mixed open on Wednesday morning as investors opt for less risky options ahead of the U.K. General Election and a European Central Bank (ECB) meeting. 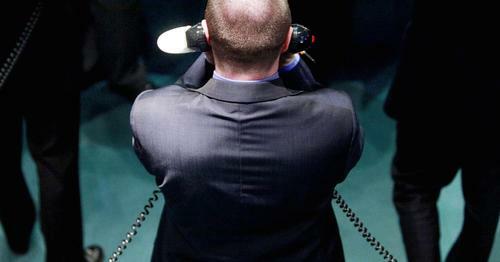 Spanish market regulator says suspends trading in Banco Popular. 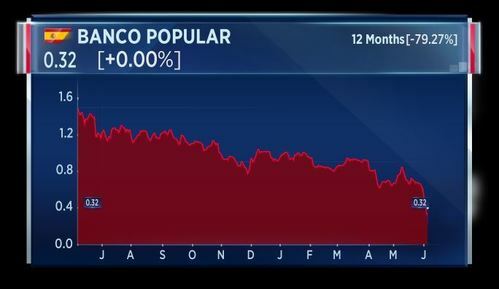 The ECB determined Banco Popular was failing or likely to dail. The central bank says decision followed significant deterioration of bank's liquidity situation. Santander says buys 100 percent of the share capital of Banco Popular as a result of a competitive sale process organised in the framework of a resolution SRB executed by the DROB. Santander says to carry out 7 billion euro capital raise as part of popular acquisition. Spanish state-owned bank fund FROB says Bank of Spain formally approves of Santander takeover of Banco Popular. That's according to Reuters. The European Commission has approved, under EU bank recovery and resolution rules, the resolution scheme of Banco Popular Español, according to an official release, based on a proposed resolution scheme by the Single Resolution Board (SRB). Santander says Banco Popular deal involves buying all shares and capital instruments of Popular symbolic price of 1 euro, says expects the deal to have neutral impact on its CET1 capital ratio. Saved by Santander! The Spanish banking giant rescues Banco Popular from liquidation, seeking to raise seven billion euros to take over the failing lender. 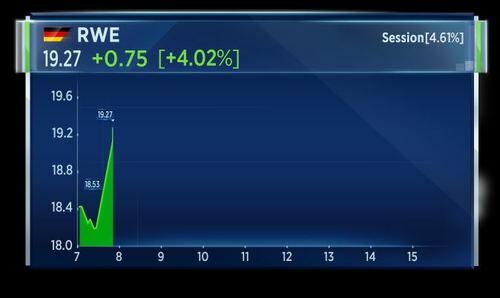 Covestro shares fall as much as five percent in pre-market trading, as Bayer moves to cut its stake in the plastics and chemicals company. Less than 24 hours to go until UK voters cast their ballot! Prime Minister Theresa May toughens her stance, vowing not to let human rights laws stop police preventing terrorism.. But some final polls for the general election show the country could end up with a hung parliament as Jeremy Corbyn's Labour party has narrowed the gap with the Conservatives. Sterling has edged higher over the course of the last seven days, with the majority of opinion polls pointing to a Conservative election victory. However, the possibility of a hung parliament continues to cloud the outlook for investors. I think the Conservatives will have a slightly higher majority than they have already. It is not going to be significant victory as they thought when they called this election. I think for Scotland, it is very unlikely they will have another independence vote without any gesture from Europe and it would have to be a fairly significant gesture. We know that Spain is pretty against giving Scotland any hope of rejoining Europe or free trade. An armed man opened fire at the Mausoleum of Ayatollah Khomeini in southern Tehran and wounded a number of people on Wednesday, the semi-official Fars news agency reported. One guard killed in shooting in Iranian Parliament. That's according to Reuters citing the Tasnim news agency. 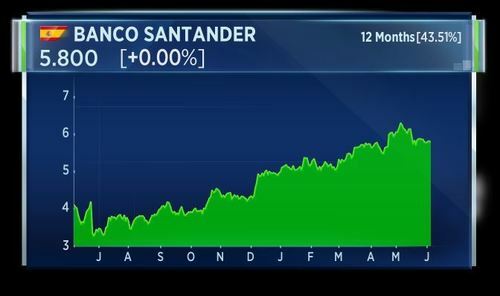 Santander is taking over Banco Popular. The Spanish bank announced it is buying all shares of its distressed peer for the symbolic price of one euro and plans to carry out a 7-billion euro capital raise as part of the deal. 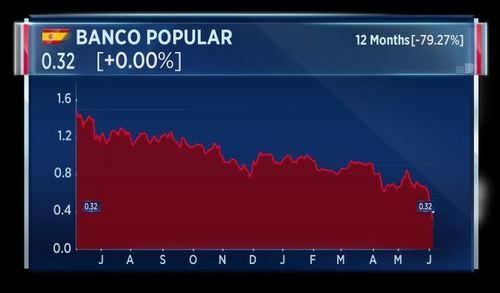 Pimco has also been hit by the crisis at Banco Popular. The Allianz-owned asset manager is the largest holder of the bank's riskiest debt, with holdings of 279 million euros, according to filings at the end of March. Standard Life Aberdeen is set to become Europe's second largest fund manager, if the two firms get the go ahead for their merger. However, the proposed tie-up comes at a difficult time for the asset management industry as competition from passive funds continues to drive down fees. 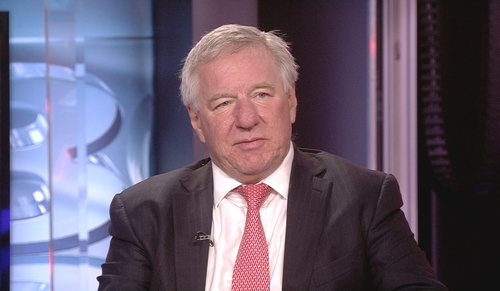 Martin Gilbert, the CEO of Aberdeen Asset Management says he has set aside £35 million to retain fund managers. He says the considers that a "relatively small amount" to retain the fund managers that are important to the company. On the Banco Santander agreement to buy Banco Popular in Spain, Gilbert says it smacks a bit of the Royal Bank of Scotland and Lloyds deal where you never know how much pressure had been put on Santander to do the deal. He says without knowing full facts it looks like Banco Santander might have been "leant on". Bayer is cutting its stake in German-based plastic materials manufacturer Covestro. 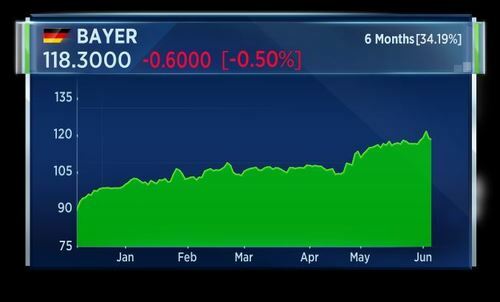 Bayer has cut holdings from 53 point 3 percent to 44 point 8 percent. 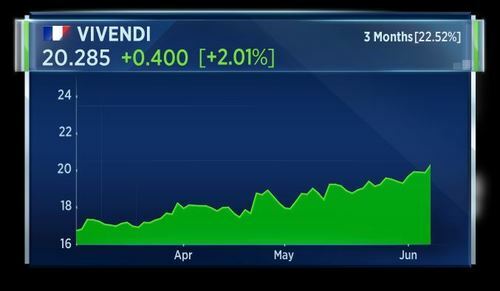 The sale is part of Bayer's plans to sever ownership ties with Covestro completely in the medium term. The shares were sold for 62 point 25 euros apiece. 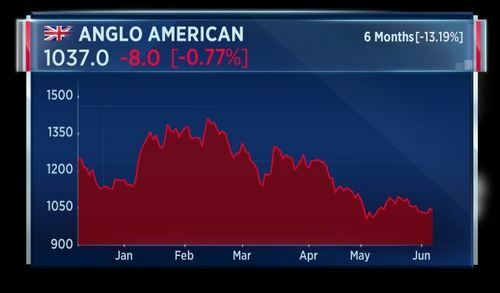 Mining giant Anglo American has a new chairman. Stuart Chambers is due to take over from John Parker on November 1st. Chambers previously served as chairman of chip designer ARM and drinks can maker Rexam and was also on the board of Smiths Group and Tesco. Spanish economy minister says resolution good outcome for Banco Popular given its situation in recent weeks. The economy minister says Banco Popular resolution has no impact on public resources, implies no contagion for sovereign and banking sector risk. That's according to Reuters. Santander says to name a new board and a new chairman at Banco Popular as of today. 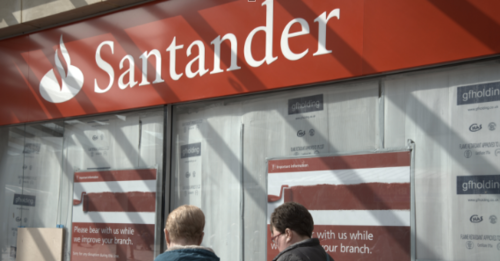 The banking giant says Popular brand to disappear, lender to be fully integrated into Santander. That's according to Reuters. 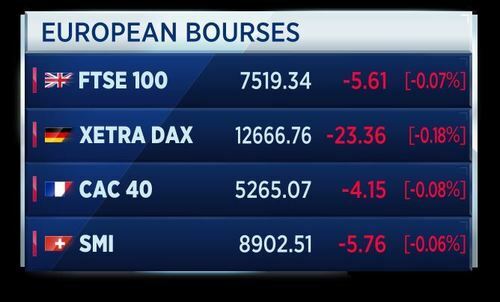 CNBCBourses in Europe open lower on Wednesday morning as investors opt for less risky options ahead of the U.K. General Election and a European Central Bank (ECB) meeting. 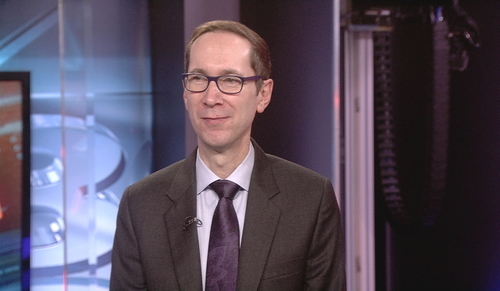 Our strategist on set today is Daniel Morris, Senior Investment Strategist at BNP Paribas Asset Management. You should sit back when we get the occasional volatility but fundamentals in most of the major economies are good. Importantly, we don't see any imbalances that are likely to provoke a recession. Morris talks down the risk of China, noting that while it does have large debt and turbulence could occur, the country still has massive FX reserves to cushion any soft economic performance. He says in Europe he is relatively optimistic for stocks but admits it is quite hard to nail down a single positive catalyst for any fresh share rally. Shares in the Spanish Banking giant Santander fall, as it announces a 7 billion euro capital raise to fund the takeover of its failing peer Banco Popular. Covestro shares fall to the bottom of the Stoxx 600, as Bayer moves to cut its stake in the plastics and chemicals company. 23 hours to go until UK voters cast their ballot! Prime Minister Theresa May toughens her stance, vowing not to let human rights laws stop police preventing terrorism. The Halifax survey is showing a month-on-month rise of 0.4 percent rise for May. That number above expectations. Britain's political parties are in their final day of campaigning ahead of what's likely to be a head-to-head showdown between Theresa May's Conservatives and Jeremy Corbyn's Labour Party. The candidates are expected to reinforce their core positions ahead of tomorrow's vote. May has promised a £23 billion Brexit fund while Corbyn warns there's "24 hours to save the NHS." 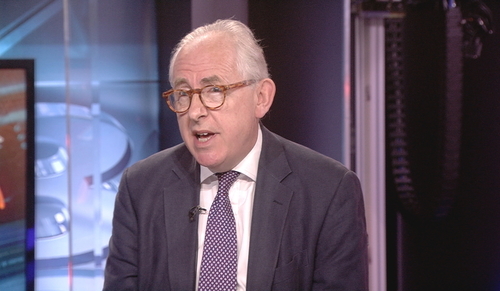 Hamish Sandison, Chairman of Labour Business is on set. The Labour party has proposed increasing corporation tax to 26%. He says Labour would raise corporation tax to raise investment cash for companies and the Labour level would still be the lowest in the G7. Hamish Sandison argues that the Tories have given no promises to "not raise" corporation taxes and "that's the thing to worry about". German utilities scored a major victory on Wednesday after the country's top court declared a nuclear fuel tax as illegal, enabling them to claim back 6 billion euros ($6.76 billion) in badly-needed cash. Germany's Constitutional Court on Wednesday said that the tax, which was imposed between 2011 and 2016, was "formally illegal and void", boosting shares in RWE and E.ON EON, which were up 4.7 percent and 5.4 percent, respectively. The UAE has reportedly banned expressions of sympathy towards Qatar. Local media reported that offenders face a punishment of up to 15 years in jail. The kingdom is part of a group of Gulf states that have severed ties with neighbor Qatar accusing it of supporting terrorism. CNBC's Hadley Gamble says those countries who have cut ties with Qatar feel somewhat emboldened by support from the White House. 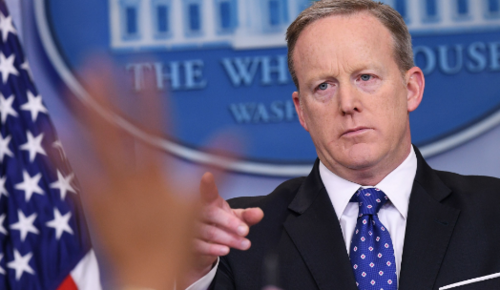 White House Press Secretary Sean Spicer speaks during the daily briefing in the Brady Briefing Room. I think there is note that his message on toughness on terror finance and extremism is being heeded by countries in the region. But the U.S. still wants to see this issue deescalated and resolved immediately. 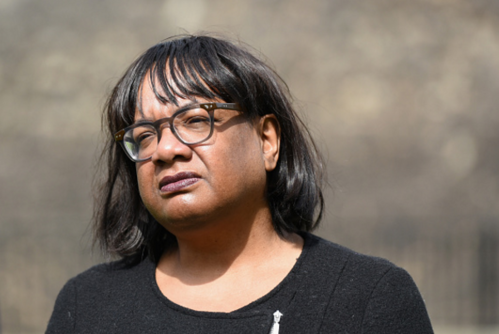 According to several media reports, the U.K. shadow Home Secretary Diane Abbott is to step down due to illness. The U.K. election takes place tomorrow. She is to be replaced by Lyn Brown. Abbott had missed media interviews citing ill health. Her performance in recent interviews had attracted widespread criticism.